The Ted Cruz campaign made a breakfast stop in the Walmart parking lot on S. Rice Avenue in southwest Houston early this morning. 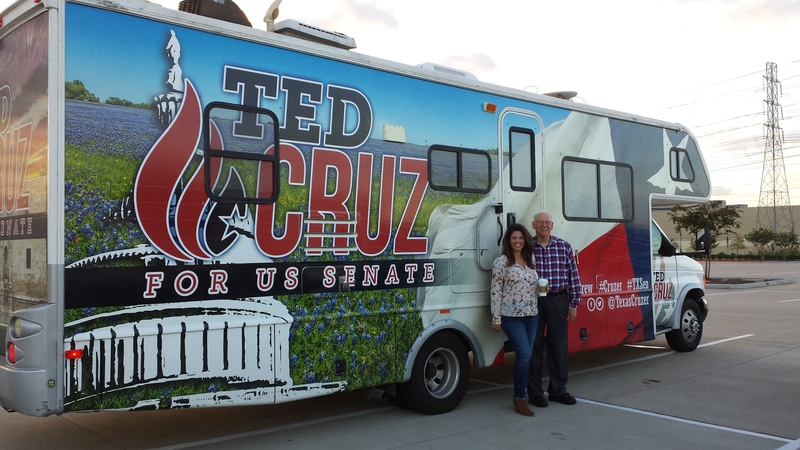 The “Ted Cruzer” with the U.S. senator’s father, Reverend Rafael B. Cruz and his niece were along for the ride this morning to rally support and votes. Communications director Joseph Wade Miller said the “Cruzer” is headed to Waco, Texas today. The RV also has its own social media accounts. Incumbent Senator Ted Cruz is seeking re-election to the U.S. Senate on November 6, 2018. Senator Cruz and other candidates will appear on the March 6, 2018 primary ballot of their respective political party. Early voting in Texas starts next Monday, October 23 for the November 7, 2017 election. Registered voters will decide State of Texas propositions, city propositions and elect local school board members and trustees in Harris County this November. This entry was posted in Asian Community, Asian Community Houston, Church News, Community Alert, Community Events, Elections and Politics, Harris County News, Houston News and tagged Rev. Rafael B. Cruz, Senator Ted Cruz re-election campaign, Ted Cruzer. Bookmark the permalink.